If a volume weighted average is used during the European session, you will often see a lot of “false” volume spikes. The reason is that it compares the volume with the overnight session, which is comparatively light on volume. A similar issue can be seen if you run a volume weighted average, Bollinger or Standard Deviation Bands during the regular session. 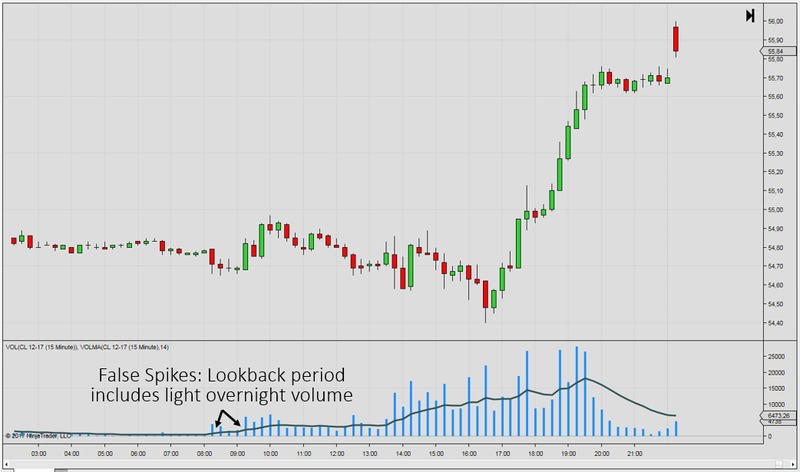 Volume spikes are then often missed because the lookback period compares with the regular open, which often has the highest volume during the session. 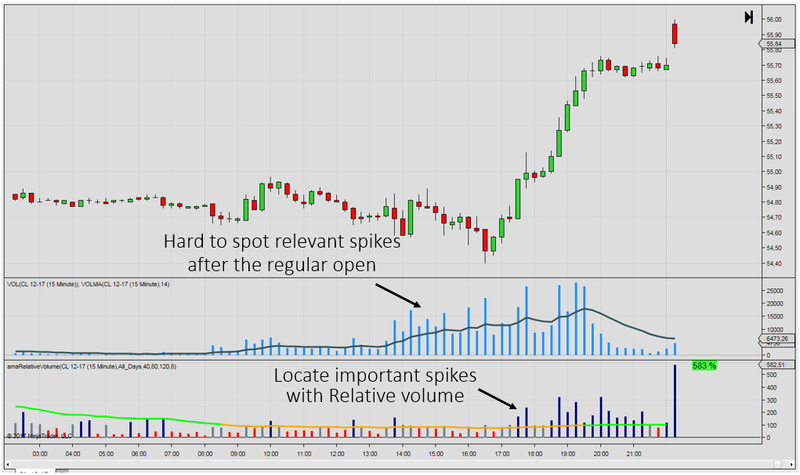 This issue can be solved with the Relative Volume indicator, because it allows you to compare the average volume at a specific time of day, with the average volume of the past N days. Therefore, it compares the overnight volume with the overnight session, the volume of the European session with the European session, and the volume of the regular session with the regular session. Furthermore, the indicator allows you to compare the average volume at a specific time and day of the week. This is useful for days and times where news reports are issued (the weekly petroleum and natural gas reports for example). Today’s volume is then compared with the average volume calculated for the same day of the week over the N preceding weeks. Accordingly, the Relative Volume indicator puts you in a better position to identify increasing / decreasing volume and filter out noise signals. The indicator can help determine whether to pursue breakout strategies when cumulated relative volume is above average, alternatively strategies for a ranging market when volume is below average.